2. The leaves are slowly changing colors. Simply enough – this transition makes for beautiful wedding pictures. 3. Pumpkin spice lattes and apple cider drinks are starting to appear on the café menus around town. Nothing is better than waking up on a beautiful, breezy morning with a warm drink to get the day started – especially on your wedding day. As you can see, the wedding industry allows us to experience all these qualities that can make for a beautiful fall wedding…on a weekly basis. Even though Beyond Details isn’t a photography company that snaps the beautiful pictures or the coffee shop serving the morning cider, we DO get to fix different recipes to fit our clients need. They give us their ideas – we make it happen. While thinking of apple cider and different fall recipes, Beyond Details has a large variety of menu items, which guests seem to LOVE. One item in particular is our gourmet coffee station. 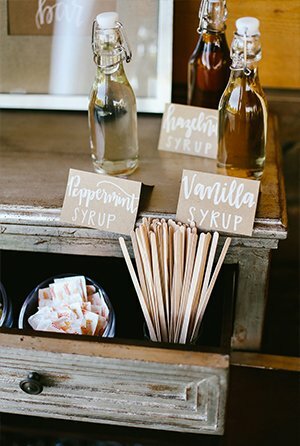 Having a coffee station adds character to a wedding and allows guests to choose their own flavors and condiments. Whether it’s pumpkin syrup or peppermint creamer, there are options and no guest has ever complained about having too many options. Two additional dessert items that pair PERFECTLY with the coffee bar are the bite-size, chocolate ganache s’mores and the s’more bar. 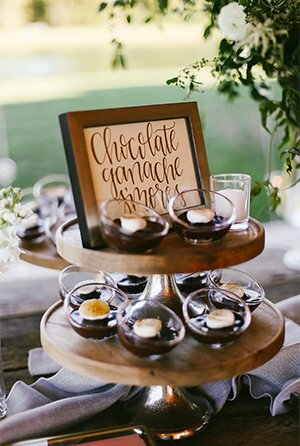 These items are ideal for fall weddings, great for young children, and add presentation. It’s not always easy making food look pretty but we believe presentation falls closely behind the quality of our food. Check us out and you can see for yourself! If you having additional comments – continue to look at our sample menus online or send us a message at info@beyonddetails.net.